When you get a new garage door installed, you’re going to have a lot of options to choose from. Here at Nabors Garage Doors, we offer traditional style Amarr steel garage doors, carriage house doors, and specialty doors. Once you choose the style, you’ll be able to customize panel designs, window types and sizes, and of course the color. But the decisions don’t stop there. You’ll also be able to choose between torsion springs and extension springs for your door. We almost always prefer torsion springs because they’re reliable and there are fewer moving parts. Let’s take a look at some of the reasons we recommend torsion springs. Torsion springs are a newer spring system in garage doors found in the shaft above the garage door. Extension springs, on the other hand, are smaller and attached to the sides of the door. Torsion springs wind and unwind to open or close the door whereas extension springs expand or contract. Extension springs last around 10,000 cycles and torsion springs last between 15,000 to 20,000. That means, if you take good care of your garage door, your torsion springs could last twice as long as the extension springs without having to be replaced. Without your garage door opener, you’d have to open your garage door by hand every time. Since torsion springs allow for more controlled movement and less weight on the garage door opener, you’ll ensure that your opener lasts as long as possible without needing to be repaired or replaced. Another reason torsion springs have largely replaced extension springs is for safety reasons. We’ve all heard horror stories of extension springs breaking and shattering car windows or injuring people. Fortunately, torsion springs don’t go flying if they break, they’ll stay on the door. Simply put, torsion springs are easier to maintain. Since extension springs have more parts, there’s more that can go wrong. 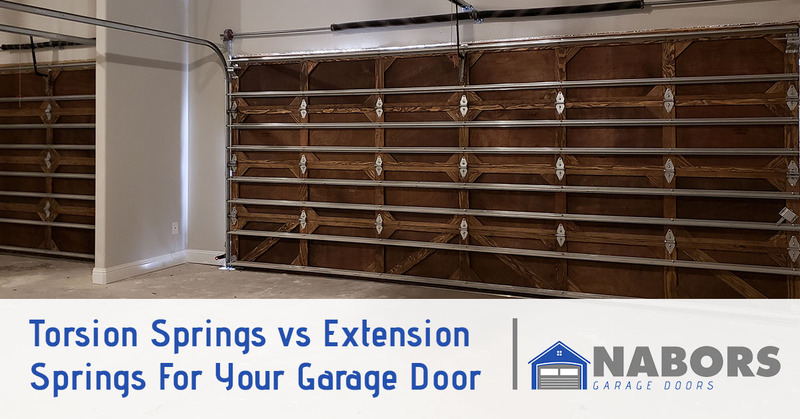 Extension springs have sheaves and require a longer cable and if one of them breaks or wears out, your garage door could become lopsided meaning it won’t even function or other parts of the door could be damaged in the process. The good thing about today’s garage door industry is that there is no lack of choice. However, that makes it all the more important that you work with a reliable garage door repair company. If you have extension springs on your garage door, speak with Nabors Garage Doors to see if it might be a good idea to get them replaced with torsion springs. Although you could spend time scouring the internet for “garage door repair near me” or “garage repair near me,” you could simply give your top-rated garage repair company a call here at Nabors Garage Doors. We offer the lowest prices in Suwanee and the surrounding areas and are happy to consult with you for free about your next project.